Firstly, a word on what this book is NOT. It is not the blueprint for a neo-con crusade against Islam. It started out as an article in the American journal Foreign Affairs in 1993, later expanded for publication. At times Huntington has difficulty making his evidence sustain a full book-length thesis – the Balkan wars of 1992-95 are covered so many times that the reader will probably feel they have lived through the siege of Sarajevo. But although the book is ten years old, it still comes out as fresh and relevant. Huntington’s thesis is very simple. The Cold War was about The Free World (that’s us, the good guys) versus The Reds (the baddies) with everyone else veering between one side or the other; now that the Cold War is over, international relations will become an uneasy competition between up to nine Civilisations (Western; Latin American; Orthodox Christianity; Islam; Hindu; Sinic/Chinese; Buddhist; some sort of African; and perhaps Japanese). The relative power of the West is declining, so America is going to have a harder time ensuring that its will prevails. This model is an academic tool for analysing international relations. States will tend to be supportive of those within their own civilisation, and unsympathetic (if not hostile) towards others. Some states will be cleft countries, sat astride a fault line with inhabitants belonging to rival civilisations, e.g. Bosnia-Herzegovina, Sudan, Sri Lanka and Ukraine. These countries will be unstable and prone to hostilities, often with outside states intervening to aid their kin. Other countries will be torn states where the population belong to one civilisation but the governing elite wish to align with another. Examples include Turkey (a Muslim country trying to become a European state); and Mexico (a Latin American country trying to become a Western consumer society). Here governments will be unstable, and prone to policy flip-flops. So, Huntington is not saying that countries ought to attack opponents from a rival culture, merely that for the foreseeable future, all other things being equal, that will be the tendency in the system. World peace requires the core states of each civilisation (e.g. USA, Russia, India; China) to maintain good communications and understanding (i.e. divide the world between them). 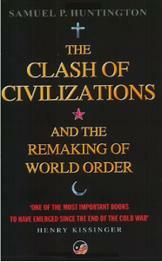 Unfortunately some civilisations – notably Islam, but also Latin America – lack a core state perceived as its dominant cultural force, and this creates instability: no major power has the unquestioned authority to enforce discipline over rogue elements, leading to inter-state rivalry for dominance. Actually, Huntington does have an agenda, but it only comes out in his final, best, chapter. He wants to launch a neo-con crusade against – liberal multiculturalism in American universities. (Muslim terror and Chinese expansion are all very well, but nothing must get in the way of a Harvard man lobbing a few grenades at Yale.) The world, says Huntington, is dominated by resurgent cultural differences. Most people view the theory of universal human rights as a cloak for Western hegemony. In these circumstances, it is geopolitical suicide to destroy your own cultural distinctiveness at home in favour of some non-existent feel-good theory which no-one else supports. His subtext: forget the UN as a serious arm of diplomacy (at best it will have anti-Western common values); watch out for China as the Next Big Enemy. So: is Huntington right, and if so, what do we do about it? He undoubtedly succeeds in his undeclared aim of demolishing Fukuyama. The End of History now looks as accurate as Norman Angell’s prediction in The Great Illusion of 1910 that global trade had made war impossible (and for which Angell won the Nobel Peace Prize – in 1933). Any theory can be defeated in its detail. If Huntington were 100% correct, the SAS would be in Darfur rather than Helmand. He has been wrong so far in predicting inter-civilisational strife as the major source of modern conflict (most wars are fought between members of the same civilisation: they’re easier to fight). An audience of 2006 is less willing to believe in a monolithic West where a Franco-German Europe is America’s client state. Where’s the Anglosphere? On the other hand, Huntington did predict correctly the absorption of some (but not all) Eastern Europeans into the EU and NATO; the wave of anti-American governments across Latin America; and internal problems in Ukraine. Tories would probably approve of his strictures against multi-cultural relativism, and be surprised to see that he warns (in 1996) that an official belief in the universal applicability of Western values (e.g. democracy) is more likely to spark civilisational war than prevent it. Huntington’s basic thesis, that the world is aligned along cultural rather than economic/political divisions, is probably more right than wrong – but was it ever different? In the Cold War, how many tin-pot dictators really cared about liberal democracy or communism? The civilisation model of international relations should be used with full awareness of its limitations – including the dangers of viewing geopolitics from the wrong angle. When Osama bin Laden sent the planes into the World Trade Center it was as much to stake a claim to his leadership of the Muslim world as to strike a blow at the West. What is happening is not so much a clash between Western and Islamic civilisations, as an Islamic civil war into which the West is being dragged. And the real enemy of both sides is China. One hundred years ago, the Great Powers were squabbling over the Balkans, and eventually launched a war of mutual attrition. Unwatched on the sidelines, America emerged to become Top Nation. I expect that somewhere in a bunker beneath Peking there are a few old men who’ve noticed this. But what are we going to do about Iran? A second edition of this book is required. William is Area Deputy Chairman for Political Campaigning in London North East. Very good book oft quoted much misunderstood. Really good book with some insights which have uncannily become true.